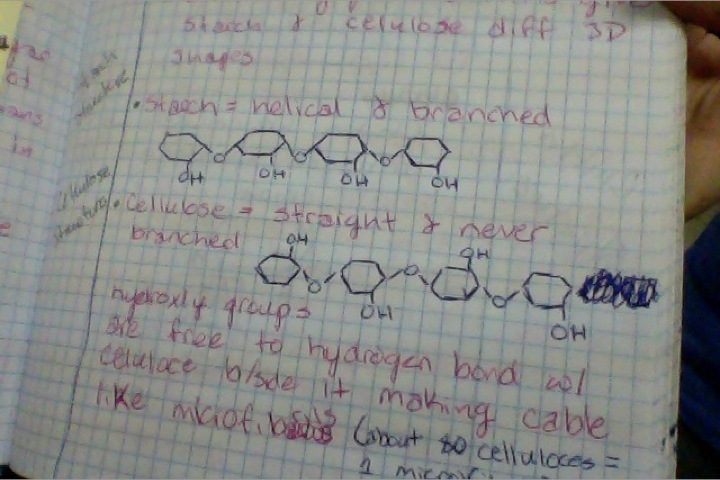 Cellulose is harder to break down because it grows straight and it won't branch off, like starch does. Starch is easier to break down than cellulose. Starches break down as glucose. Starches are smaller than cellulose so it can be used as energy easier. Cellulose is needed for fiber in the human body. Cellulose is the reason plants grow straight up. Prokaryotic cells does not have a nucleus, but eukaryotic cells do. Therefore DNA in prokaryotic cells are not inside of a nucleus. DNA is not really structured in prokaryotic cells, the DNA is simply a loop. In eukaryotic cells, the DNA is organized in chromosomes. Eukaryotes have a membrane-bound nucleus. The genetic material in inside the membrane-bound nucleus. In eukaryotes, since there is a nucleus, the DNA is in the nucleus. Cell membranes have a lipid bilayer, the lipid bilayer has 2 layers of fat. The lipid bilayer acts as a barrier. Phospholipids organize themselves in the bilayer, so that their hydrophobic tail regions are hidden and their hydrophilic side is not, as is exposed to water. This layer is the wall between the inside and outside of the cell. The most common example of water transport is in plants. The water molecules stick to the cellulose molecules in the walls of the xylem. (Xylem up, phloem down), xylem is the tissue that conducts water and nutrients in vascular plants. Water molecules are removed by transpiration in leaves. The other water molecules begin to move up and take the other water molecules place and pulls more molecules along with it to nourish the plant. In cohesion, water is attracted to water. When a water molecule is surrounded by other water molecules, the molecules can begin to form a ball. Atoms are the smallest particles of an element. Protons have a positive charge, Neutrons have a neutral charge and Electrons have a negative charge. Protons are equal to electrons. Electrons revolve around the nucleus of an atom. Protons and neutrons are in the nucleus of an atom. Protons are equal to electrons. The more electronegative an atom it has a higher affinity for electrons. The atom wants its outer shell to be full. The atomic number is the number of protons. The number if neutrons is the mass number minus the atomic number. We use lipids to gain energy, these lipids have three fatty acids attached to a glycerol molecule. We get these lipids from the foods we eat such as, peanut butter. Instead of having three fatty acids attached to a glycerol, a phospholipid has two fatty acids attached to a glycerol. A phospholipid has a hydrophobic tail and a hydrophilic head. In an aqueous environment these phospholipids would form a bi layer. In some cells there are proteins embedded in the phospholipid bilayer. The primary structure of a protein is one strand. The 2nd structure is either a alpha helix or a beta pleated sheet. The third structure is the tertiary structure and the 4th is the quaternary structure. The folding of the protein determines what the protein will do. The most important structure is the tertiary structure. This is because the shape of the protein determines if can do its job (form fits function). If a protein is denatured the shape is changed and it can't do its job. A simple change in the primary structure can affect the proteins ability to function. A change in the proteins shape can cause conflicts such as sickle cell etc. Physical and chemical conditions of a proteins environment can cause change. When the change happens this is when the protein can be effected and not be able to perform its job properly. The most important proteins are enzymes. Enzymatic proteins regulate metabolism. Regular lipids can be found in the foods we eat (peanut butter), these lipids have 3 fatty acids and a glycerol. Phospholipids have two fatty acids instead of three, and it is still attached to a glycerol. Phospholipids are very important in the cell membrane. These phospholipids form lipid bilayers, to protect the cell. Phospholipids usually have a hydrophilic head and a hydrophobic tail. The bilayers keep water away from hydrophobic tails and keeps water near the hydrophilic heads. Nitrogen is a component in all amino acids, which means it is in proteins. It's obviously present in the nitrogen bases that make up nucleic acids in DNA and RNA. The nitrogen in plants is found in chlorophyl which helps plants to grow and is important in photosynthesis. Phosphorus is an important nutrient for plants and animals, in the form of ions. Phosphorus enters the biosphere in many different ways. The decomposition of organisms releases phosphorus. Phosphorus stays on land and in rocks and soil minerals. Most phosphorus is used to make fertilizers. Phosphates also is a component of nucleotides. it serves as an energy storage within cells. The double helix of DNA is a result of the phosphate that binds to the helix. Phosphates move through plants and animals. As plants and animals decompose phosphate is released. This process is repetitive. Alpha and Beta glucose only differ in the direction that H and OH groups point on Carbon. Alpha glucose molecules are put together to form starch. Beta glucose molecules are put together to form cellulose. In carbohydrates an H from one carb & an OH from another are taken out and they form water. The two carbs are held together by a glycosidic linkage. If dehydration synthesis continues over a long period of time a long complex carbohydrate chain is formed. This long complex carbohydrate chain is known as a polysaccharide. The strands of DNA are replicated they line up antiparallel, they line up end to end. Single strands of RNA and DNA sequences are in a 5' to 3' direction. The nucleic acids can only be synthesized if there is a 5' to 3' direction. The polymerase used to make new strands have to attach a new nucleotide to 3' group. The nitrogen bases in DNA are hydrogen (weak) bonds. The sequence of these nitrogen bases give the organism its individual unique traits. These bonds are weak because these bases have to be copied to make the second strand of DNA. The cell needs to be able to separate the strands and make a new strand for each. A cell can replicate a DNA molecule to produce two identical molecules. If the strand is not copied correctly a mutation has occurred. Some mutations can be harmless and some can result in complex complications. The DNA carries genetic instructions for all protein synthesis that is needed to make the new cell. The DNA has to be changed to RNA because the DNA stays in the nucleus as genetic material while RNA can travel outside of the nucleus. The RNA is able to make proteins. The charged regions of a polar water molecule is attracted to oppositely charged regions of the molecules around it. Each molecule can bond by a hydrogen (weak) bond to multiple molecules. Adhesion is the attraction between different kinds of molecules. Cohesion is the binding together of like molecules, often by hydrogen bonds. The hydrogen bonds that hold the substance together is cohesion. Cohesion deals with the transport of water and dissolved nutrients against gravity in plants. Water reacher the leaves of a plant through water-conducting cells. Cohesion from the hydrogen bonding helps to hold together the water within the cells. The adhesion, which is the clinging of one substance to another, helps to resist the pull of gravity on the water. Plants need nitrogen and phosphorous so that they can proteins and nucleic acids. 80 % of the air is nitrogen. Plants get the nitrogen they need from soil. Many farmers use fertilizers to add nitrogen to the soil and help plants grow bigger and faster. Phosphorous enters the biosphere from the soil, by absorption by plants roots. In most soils phosphorous that is absorbed by plants roots come from organic molecules that that have been decomposed . The decomposing of organisms releases phosphorous. This phosphorous that is released is able to be used by plants. Phosphorous is used by organisms in energy transfers such as ATP. It's aslo used in RNA and DNA, and in phospholipids. Organisms that eat plants take in phosphorus and nitrogen since these elements are in the plants. When an organism is decomposed it releases phosphorus, which is how phosphorus is back to the biosphere. This cycle continues. Nitrogen is always in the air and comes from soil. DNA and RNA are made out of nucleotides, which are made up of sugar, a phosphate group and a nitrogen base. The backbone is composed of sugar and a phosphate. The sugar in DNA is deoxiribose, while the sugar in RNA is ribose. The backbone has covalent bonds (strong bonds) between the sugar and the phosphate group. It is important the the bond between in the backbone is covalent (strong) because the structure can't be broken, because DNA is double stranded. Hydrogen bonds (weak bonds) hold together the nitrogen bases (Adenine, Thymine, Cytosine and Guanine). These bonds need to be weak because these bases have to pair up (A-T) (C-G) and then these bases are copied to other side to make up the second strand of the DNA. DNA must be copied before a cell can divide. Enzymes open up the helix and separates the strands. The DNA polymerase is the enzyme that matches with the nucleotide and it copies the DNA. RNA is single stranded and it contains uracil instead of thymine. There are three different types of RNA messenger RNA, ribosomal RNA and transfer RNA. Transfer RNA transfers amino acids to the ribosomes to make proteins. Ribosomal RNA makes up part of the ribosomes. Messenger RNA sends code from the nucleus to ribosomes. RNA polymerase turns a strand of DNA into RNA. The nucleus allows RNA polymers inside which lets the RNA polymerase change the DNA into RNA. The mRNA travels out to the ribosomes, then tRNA comes and pairs with amino acids. The codons make proteins. Cellulose is a polysaccharide, it's a form of a carbohydrate. There are strong bonds between cellulose, so It is hard to break down cellulose, so our bodies and animals can't break down cellulose. Cellulose is present in plant cells. It's one of the most abundant organic compounds on earth. Humans and animals eat plants which is how they obtain cellulose. Animals that only eat plants have special sacs in the digestive system that helps break down cellulose. Humans can't break down cellulose either which is why your digestive system is emptied after you eat corn which has cellulose. The cellulose helps the intestines because it clears the intestinal walls. Keeping intestinal walls clear helps prevent colon cancer. Starch is made of many glucose molecules. The starch is broken down into glucose, which living organisms gain energy from. A phospholipid contains one or more phosphate groups. Phospholipids are very important in the cell membrane. These phospholipids form lipid bilayers, to protect the cell. Phospholipids usually have a hydrophilic head and a hydrophobic tail. It only has two fatty acids that are attached to a glycerol head. They have a polar end and a hydrophobic end. In an aqueous solution they will form bilayers. These bilayers keep water away from hydrophobic tails, and keeps the hydrophilic head with the aqueous solution. The phospholipid membrane is semi- permeable. The phospholipid membrane allows certain molecules such as oxygen, carbon dioxide and small hydrocarbons to freely diffuse. Charged ions, large molecules and polar molecules can't diffuse freely. A hydrophobic property would cause the amino acid to repel away from water. A hydrophilic property would cause the amino acid to be attracted to water. A positive ionic bond would cause the atoms to be attracted to a negative ionic bond, while a negative ionic bond would be attracted to a positive ionic bond. Because of polarity, hydrophilic amino acids interact in an aqueous environment. Hydrophilic would want to be on the outside of the protein. Hydrophobic would want to be on the inside of the protein. The folding of the protein determines what it will do. The actual folding of the proteins are determined by the side chains (R group) interactions. Water is a polar substance because there are opposite charges. This happens because the oxygen molecule is more electronegative than the hydrogen molecule. This electronegativity makes the oxygen more negative and the hydrogen more positive, this is what makes it polar. The hydrogen side being attracted to another electronegative molecule creates a hydrogen bond. Because of water's polarity, substances such as fats, oils and waxes do not mix with water. Water is the universal solvent, which is why it dissolves most things. In water, hydrogen is positive and oxygen is negative. The polarity causes water to be able to dissolve most things. Water is important in photosynthesis because plants need water to live. Water helps plants to make their food, it's a product to photosynthesis. Plants take in carbon dioxide and water and produce glucose and oxygen through photosynthesis. We breathe out carbon dioxide and we need glucose in our bodies. This is where the carbon cycle is important. We eat plants to gain glucose and plants give off oxygen, which we need to survive. The plants need carbon dioxide which we breathe out.